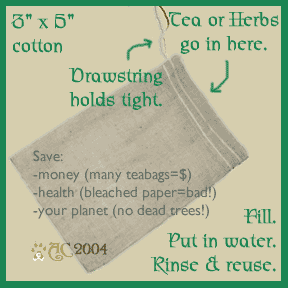 More Information: This cotton teabag can be used and reused an infinite number of times. Fill it with your favorite tea, herbs, or even potpourri. Can be used in the bathtub for a soothing herbal soak or a drawer for a natural sachet. To clean: hand-wash with mild detergent in hot water; use an oxygen-type cleanser if desired. Rinse well before use. Size is approximately 3"x5" (7.6x12.7cm). Related Products: Tea Infuser, Tea Strainer. This product first appeared in our catalog on Wednesday 01 December, 2004.